Sydney is my precious niece and godchild. My sister and brother-in-law, Amanda and Tim, would like to share a little bit about their journey with Sydney. “Nine years ago our sweet Sydney was welcomed into our family. We were so happy and relieved to have her with us and yet so new and naive to the situation we suddenly found ourselves. To make a long story short, within the first few months of Sydney’s life, we discovered that she had severe brain damage caused by a virus they believe I contracted while pregnant called Cytomegalavirus (CMV). 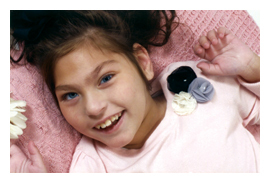 As a result, Sydney was left with cerebral palsy, cortical vision impairment, sensorineural hearing loss (deaf-blindness), supraventricular tachycardia, severe reflux, a G-tube and tracheomalacia. The list can seem overwhelming, but we try not to let it overshadow the beautiful little girl she is today. As you can imagine, my husband and I have been around the block a time or two when it comes to dealing with medical staff, pharmacies, therapists, case managers and insurance companies. We have had to advocate for Sydney every day of her life. We have seen countless doctors give up on Sydney when they couldn’t find the source of her illness. We have had pharmacies confuse her heart medications with other patients which may have resulted in death if we had not caught it. At times we have been encouraged to proceed with unnecessary and painful procedures while other times we have had physicians discourage lifesaving procedures to prevent us from dealing with our daughter’s questionable future. Time and time again, we face each challenge as it comes and as a team. We have always found that our best weapon is educating ourselves before we make decisions. It is so important to be proactive in your care whether it’s by doing your own research, speaking with other people in your situation, getting second opinions, or consulting with a patient advocacy service.